Born in 1581 into a farming family in Pouy, France, Vincent’s initial desire to be a priest was mainly for social advancement and monetary gain. Through a process of careful planning and being in the right place at the right time, Vincent was ordained a priest at the ripe age of nineteen by an elderly bishop who could barely see or hear. Beginning his ordained life with less than pure motives, Vincent’s change of heart began in the middle of one of his visits to the poor tenants of a wealthy estate holder. When Vincent was called to hear the confession of a dying man, the spiritual naiveté of the penitent shocked Vincent. The poor man knew next to nothing about his religion. Not long after, Vincent preached a sermon on general confession from the pulpit in the village chapel of Folleville, France. In it he asked the people to take to heart the necessity of repentance. The response overwhelmed him. The Congregation of the Mission was born. More men became priests to join Vincent and his three original companions and began preaching all across France. Vincent’s works are astounding when viewed as a whole. Within Vincent’s lifetime the Congregation of the Mission had spread throughout the world. At Vincent’s funeral, the preacher declared that Vincent had just about “transformed the face of the Church”. No one disputed this claim. Funny, charming, impassioned, candid – Vincent de Paul had an extraordinary capacity to connect with all types of people and to move them to be inflamed with the Gospel and to live their lives in charity. His basic vision was simply that the Good News of Jesus Christ should be announced to the poor through word and service. 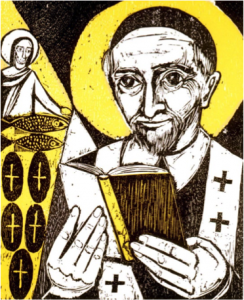 Source: “Vincentian Encyclopedia.” Vincent De Paul – .Famvin News, 2013. Web. 1 Oct. 2015. Born out of wedlock in Paris in 1591, Louise never knew who her mother was but was acknowledged and raised by her father, Louis de Marillac, a member of the aristocracy. When her father married, Louise had a difficult time adjusting and was sent as a resident student to a Dominican convent where her aunt was a religious. This experience deepened Louise’s introspective ways and her many intellectual skills, as well as her desire to be a religious. After her father died and resources were limited, she lived in a boarding house where she had the opportunity to learn many basic domestic and organizational skills, as well as the secrets of herbal medicine. This experience rounded out her classical, upper-class education and prepared her well for her future service. Suffering was never far from Louise. During civil unrest, her two uncles who held high rank within the government were imprisoned. One was publicly executed and the other died in prison. In 1623, when illness was wasting Antoine (who died in 1625), depression was overcoming Louise. While at prayer, Louise had a vision in which she saw herself serving the poor and living the evangelical counsels in community. She wrote this “lumière”(“Pentecost experience” of Saint Louise) on parchment and carried it on her person as a reminder that despite her difficulties, God was guiding her life. In that vision a priest appeared to her, whom she later identified as Vincent de Paul, her future confidante and collaborator in ministry. 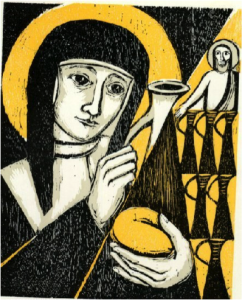 Source: “Vincentian Encyclopedia.” Louise De Marillac – .FamVin News, 2013. Web. 1 Oct. 2015. In the United States, the Sisters of Charity and Daughters of Charity trace their origins to Elizabeth Ann Seton, a widowed New York socialite who embraced the Catholic faith and founded a community of women in 1809. Born in 1774, Elizabeth Ann Bayley was the daughter of a prominent physician. At the age of 19, she married William Seton, whose family owned a successful import business. They had two sons and three daughters. Through most of their married life, William Seton suffered from tuberculosis. In 1803, after suffering severe business losses, including bankruptcy, William’s health deteriorated rapidly. After weeks of travel, William died in Pisa, Italy. The widowed Elizabeth and her daughter sailed home to America in April 1804. Confronted with the need to support her five children without any help from her husband or her husband’s business, which was now bankrupt, Elizabeth opened a school in her home. After that venture failed, she decided to seek employment elsewhere. After much prayer and counseling from Archbishop John Carroll, Elizabeth accepted an offer from the president of St. Mary’s Seminary in Baltimore to establish a school for girls. She moved to Baltimore in 1808 and opened a small school. This modest beginning marked the start of the Catholic parochial school system in the United States. Elizabeth Seton took vows of poverty, chastity and obedience on March 25, 1809 and was given the title of “Mother” by Archbishop Carroll. That June, she and her followers donned a simple black religious habit and se4t out for Emmitsburg, Maryland, situated 50 miles west of Baltimore. Their first house was a cottage on the grounds of St. Mary’s College. On July 31, the group began community life as the Sisters of Charity of St. Joseph. In 1810, the sisters adopted the rules written by St. Vincent de Paul for the Daughters of Charity in France. In 1814, the Sisters of Charity began opening parish free schools, academies and orphanages along the coast. 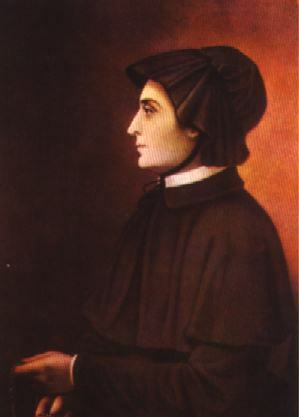 Mother Seton died at the age of 46 in 1821. The members of her community continued Elizabeth Seton’s work. In 1830, the Sisters were running orphanages and schools as far west as Cincinnati and New Orleans and had established the first hospital west of the Mississippi in St. Louis. Much later, in a response to a request from President Abraham Lincoln, more than 200 Daughters of Charity served on battlefields and in military hospitals during the Civil War. They served again in the Spanish American War at the end of the 19th century, when American Daughters in Puerto Rico shared supplies with Spanish Daughters nursing soldiers of the opposing army. Elizabeth Ann Seton, founder of the American Daughters of Charity, was beatified on March 17, 1963 and canonized on September 14, 1975. Source: seton.net, “History and Heritage”. Web.